All-Type Welding and Fabrication, Inc. manufactures a product called the "Quick Mount Plow Cart." Several years ago when marketing the product and developing a distributor base, ATWF established a relationship with a snow and ice equipment distributor in the Midwest. The distributor agreed to sell our product. Over time, the distributor inquired about ATWF’s ability to manufacture their product in the snow and ice market. The distributor requested ATWF quote a job on a state contract for salt spreaders. ATWF was awarded the contract to manufacture through the distributor and now manufactures multiple salt spreaders for this distributor. There are some versions made of stainless steel, while others are made of carbon steel with a powder coated finish. The distributor supplies ATWF with the hydraulic pumps, hoses, and other components and ATWF fabricates and welds all components to completion and then fully assembles the spreaders with supplied components from the distributor. 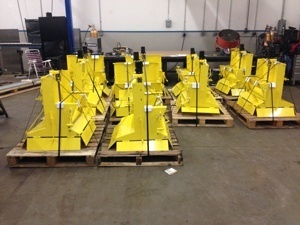 After final assembly, the units are put on skids and shipped directly to the state Department of Transportation locations. The distributor was very satisfied with ATWF’s ability to meet all of their requirements which resulted in the development of a long-term business relationship that continues to this day.